The letter that I reproduce below was slipped under the door to my apartment about a month before the US invasion of Iraq in 2003. It originated from the NAA, which I learned stands for the National Apartment Association. It's a form letter that my landlords didn't bother to customize with their identifying details - they don't believe in the new formula. It was sent to them by said association and they in turn simply photocopied and distributed it to all the tenants in the apartment building. Thus we all returned home after another cold Bostonian work-day and bent down to pick up our unadulterated advisory. We considered, with alternately concern and bemusement, the message of the day from The Authorities on the slightly-faded ink of their overtaxed fax machines and photocopiers. 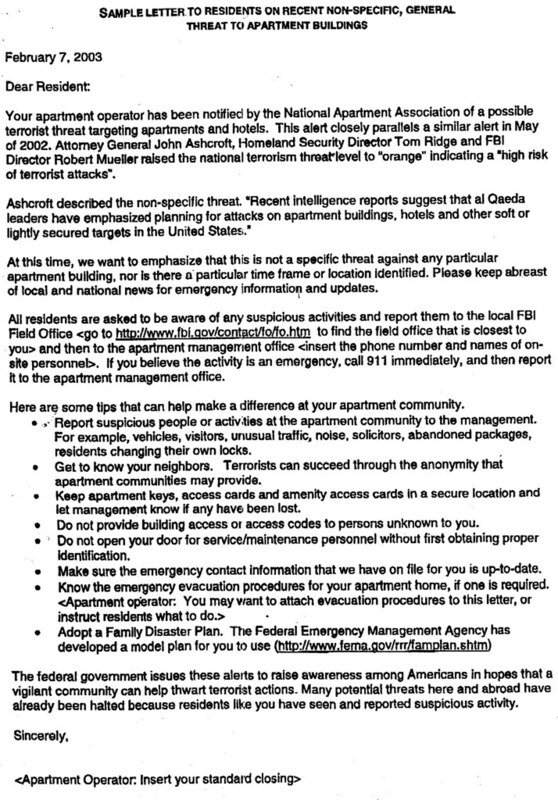 The letter concerned "recent non-specific general threats to apartment buildings" by Al Qaeda and the like. It was all there: the terrain of uncertainty, the exquisite precision of the language, the advisability of duct tape and social living in our communal relationships, not to mention the knowledge that The Authorities would deign to helpfully provide warnings about our homelands and security. Suffice to say that our little apartment community would have something to discuss in ensuing months. When the histories of the 2003 Iraq war (the second or third Gulf War depending on who is counting) and the so-called Global War on Terror are written, I hope historians and anthropologists alike can use some of this material. Where others ponder the significance of Downing Street Memos and parse notions of fixed intelligence, I'll instead focus on the small things that troubled me and my neighbours. As they search for colourful anecdotes about these trying times, I hope they might consider delineating the contours of the strange infrastructure of fear, the bureaucracy, the homelands and the security that we have seen. Perhaps like the vintage 1950s drills about jumping underneath your school desk, or hurtling into designated nuclear fallout shelters when the atomic bomb sirens sounded and that godless enemy attacked heating up that Cold War, these letters will come to be seen as quaint as some currently see the Geneva Conventions. The cynics might also consider just how fear can be manipulated and to what ends. It is surely a matter of pure coincidence that just two days earlier the then Secretary of State, Colin Powell, had made his legendary speech apropos Saddam Hussein's purported Weapons of Mass Destruction to the United Nations. Now safely retired after long and loyal service to his country and two generations of Bush Presidents, the good General has apparently let it be known via an aide that the WMD speech was the "lowest point in my life". I find comfort that the terrorist infrastructure of those heady days reached out to affect not just apartment dwellers in Cambridge but also the high-powered politicians and fiercesome soldiers. It gives one pause; timing is everything in life. The world got ominous tomes and Powerpoint presentations about aluminium tubes, uranium and specific bio-weapon trailers during prime time; the next day we got advisories about threats to our apartment communities. But let me not digress about burnt-out cases and fallen angels like Colin Powell even though these are some of my favourite topics, instead I thought I'd share some historical marginalia. Make of it what you will. Your apartment operator has been notified by the National Apartment Association of a possible terrorist threat targeting apartments and hotels. This alert closely parallels a similar alert in May of 2002. 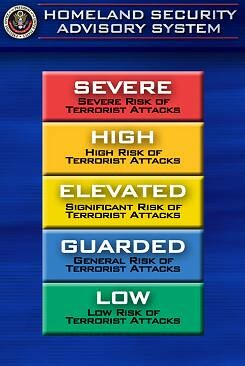 Attorney General John Ashcroft, Homeland Security Director Tom Ridge and FBI Director Robert Mueller raised the national terrorism threat-level to "orange" indicating a "high risk of terrorist attacks". Ashcroft described the non-specific threat. 'Recent intelligence reports suggest that al Qaeda leaders have emphasized planning for attacks on apartment buildings, hotels and other soft or lightly secured targets in the United States." At this time, we want to emphasize that this is not a specific threat against any particular apartment building, nor is there a particular time frame or location identified. Please keep abreast of local and national news for emergency information and updates. All residents are asked to be aware of any suspicious activities and report them to the local FBI Field Office <go to http://www.fbi.gov/contact/fo/fo.htm to find the field office that is closest to you> and then to the apartment management office <insert the phone number and names of on-site personnels>. If you believe the activity is an emergency, call 911 immediately, and then report it to the apartment management office. Here are some tips that can help make a difference at your apartment community. Report suspicious people or activities at the apartment community to the management. For example, vehicles, visitors, unusual traffic, noise, solicitors, abandoned packages, residents changing their own locks. Get to know your neighbors. Terrorists can succeed through the anonymity that apartment communities may provide. Keep apartment keys, access cards and amenity access cards in a secure location and let management know if any have been lost. Do not provide building access or access codes to persons unknown to you. Do not open your door for service/maintenance personnel without first obtaining proper identification. Make sure the emergency contact information that we have on file for you is up-to-date. The federal government issues these alerts to raise awareness among Americans in hopes that a vigilant community can help thwart terrorist actions. Many potential threats here and abroad have already been halted because residents like you have seen and reported suspicious activity. I've been wondering of late how these things are propagated, that is, how the opaquely named Department of Homeland Security gets the word out. What I wondered is the relationship between said department and the National Apartment Association? From all appearances in the letter, the NAA is simply acting as as an agent of the government but nowhere is the exact connection explicated. The NAA and its authority are simply facts on the ground. "Sample letter to residents on recent non-specific, general threat to apartment buildings"
I can't think of a better example of non-specific bureaucratese. There's a musical logic in its various clauses, or is it the poetic cadences that one should celebrate? One wonders how many other sample letters exist in the association's portfolio on any number of different topics and to any number of different audiences. One wonders also what the difference would be if the threat were old or indeed specific instead of recent and non-specific, and if the message would be more finely calibrated. At this time, we want to emphasize that this is not a specific threat against any particular apartment building, nor is there a particular time frame or location identified. One doesn't want to dwell on a cynical reading of these things because there must have been a fairly well-founded fear. I am well-versed in the anonymity in apartment life and, not to get all existential, that life can be impersonal and anomic. We could all spend more time building communities. The problem is having officialdom mandate the effort. There is only a fine line between the tame "be friendly" admonition and the hectoring "spy on your neighbours" proposition, and the plain reading of the message goes beyond "be vigilant" to "be scared". Fear is a funny thing and in small doses it can be a great motivator; its close counterpart, hysteria, is an unhealthy thing and therein lies the rub. There is a fear tax that we pay when these levels are elevated and it manifests itself in paralysis and uncritical thinking. Those who capitalize on fear can go a long way in exploiting our impairment. It is somewhat ironic then that the injunctions in the letter, like the threat that prompted them, are unfocused, generalized and, yes, non-specific. One definition of the word terror is of a non-specific fear. Those skilled at the theater of fear are much like those who spread gossip and then add "I'm not the gossipy type. I just wanted to let you know so that you would be aware." Kafka, Orwell, Ionesco and Beckett couldn't have written it better. You are made aware that there is an interlocutor, the Apartment Operator, who is taking instruction from a higher authority. Ideally the NAA should be in the background, reassuringly disembodied. Fear not said he... Everything has been personalized for you. That is what the script calls for, simply follow it. My landlords paid lip-service to the threat; they were concerned enough to circulate the warning but they were mildly subversive at the same time. I appreciate the fact that they passed the letter on without any editorial changes. Life is too short. I know a ninetysomething year old lady who gave short shrift to the letter. She had seen it all before and instead regaled us with eye-opening tales of Red Scares and life during the Cold and paranoid War. In our apartment building it was lights out that brought us together. Our coping mechanism for these troubled times was conversation. Indeed in our hallways we were mostly outraged at the sense of insecurity that the letter tried to instill in us. Our search for community was organic and we hardly needed the intervention of that terrorism industry or that army of well-meaning bureaucrats. Not to mention that the urls listed in the letter turned out to be broken links as FEMA immediately revamped its website. At present, only the FEMA kids' disaster plan page remains up. Things fall apart they say. Beyond the timing of the release of general warnings, non-specific and otherwise, it has been noted that the color-coded threat level system instituted in the US has been a little handicapped since its inception. The reason is that in order to have green be the colour for the "all-clear" threat level, the natural spectrum of light, as normally seen in rainbows, has been altered in the Homeland scheme. Thus ice cool blue has been promoted to "guarded" whereas tropical green has been demoted to "low". A bureaucrat or marketing person's intelligent design is at odds with evolution, physics and reality. I arrived in the United States at the end of the Cold War hence I missed most of the distortions that long episode had caused in the culture. I seem however to be getting an education in fear writ large over the past few years of homeland security. As I ponder a life unmoored in a sea of current liquid threats, I look fondly back to those days before sample letters came my way. These days I'm not aiming for green loot or greener pastures, I'd rather have the blues. I seek comfort in recent non-specific general threats, those I can live with.